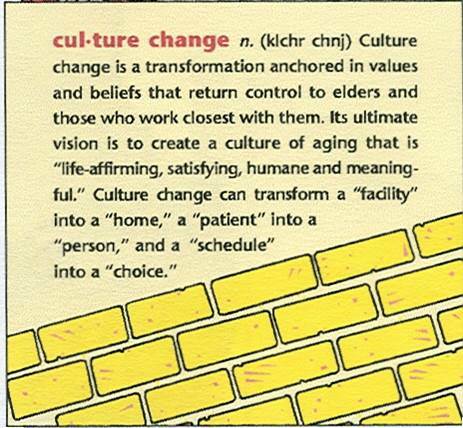 Culture change refers to changing insitutional culture (certainly not anyone's ethnical culture which by the way would be impossible anyway). From institutional care to individualized care. From being just a number, or room number often in the case of an insitution, to being known as a person. Seamless living. Culture change means your life shouldn't change even when you move into an institution. In the opening plenary of the 2014 Pioneer Network conference culture change leader Steve Sheilds pointed out that we have watered down the term culture change by using person-centered care as the work of truly and deeply changing institutional culture is so difficult. Culture change leader Dr. Bill Thomas has said all these years that the institutional culture is like a dragon that we keep trying to slay but keeps popping up. It does take drastic change, but homes have done it and we will do it. Its what we all want. CMS funded a broacast in 2002 entitled "Innovations in Quality of Life-The Pioneer Network." It is an excellent resource for training on the principles and practices of culture change.